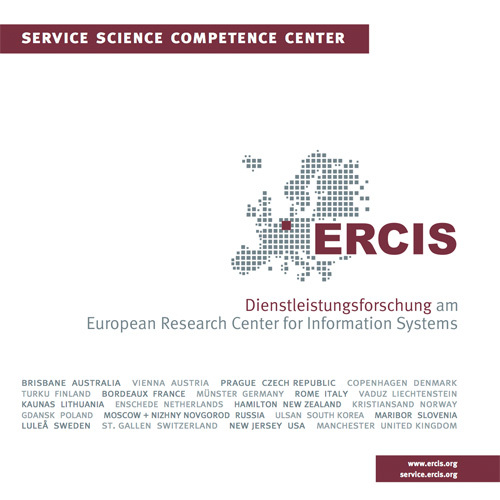 MKWI 2014 | ERCIS Competence Center "Service Science"
The ERCIS Service Science Competence Center is involved at MKWI2014 by co-hosting the track on "Cyber-Physische Systeme: Geschäftsmodelle, Dienste, IT-Architekturen" (Cyber-Physical Systems: Business Models, Services, IT Architecture). Martin Matzner and Daniel Beverungen both were involved as track chairs, working together with Christian Janiesch (KIT) and Steffen Lamparter (Siemens). More information on this track is available at: http://mkwi2014.de/Cfps/Details/6.